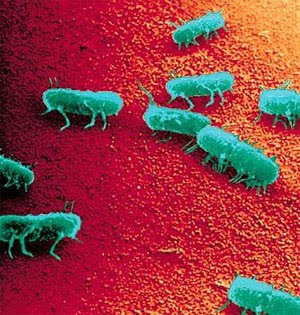 Clemson University food scientist Paul Dawson found that salmonella and other dangerous bacteria can remain alive up to four weeks on dry surfaces — like floors — and can be instantly transferred to dropped food. Location, not time, is the critical factor, researchers say. Brushing off a bagel you dropped on the sidewalk and eating it is probably safe because the pavement is cleaner than a kitchen floor in terms of the kinds of bacteria found there, Dr. Harley Rotbart, a professor of microbiology and pediatric infectious diseases at the University of Colorado, said. “The kitchen floor, however, is probably a zero-second zone because the bacteria from uncooked meat and chicken juices are more hazardous than the ’soil’ bacteria outside,” said Rotbart. Bathroom floors are also zero-second zones because they’re “a great potential source of bacteria and shorter-lived viruses that can cause gastrointestinal illness if ingested,” Rotbart said.